AURORA BOREALIS: Last night a solar wind stream hit Earth sparking a mild geomagnetic storm and auroras as far south as Montana: gallery. Earth is still inside the stream, but the storm has subsided and more auroras are unlikely tonight. The islands in the chain are as big as planets: the large leading spot is about as wide as Neptune while the others range in size from Mars to Earth. Magnetic fields connecting the leader to the trailers are unstable and crackling with C-class solar flares. It's a good show. UPDATE: This morning in Brazil, Rogerio Marcon used his Coronado SolarMax40 to catch the sunspot in mid-flare: photo. "It has a large coma and a very bright stellar nucleus," notes Chumack. "The comet's tail, however, is small and faint." 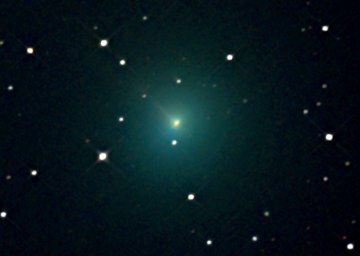 What makes the comet's atmosphere (coma) green? Answer: The coma contains cyanogen (CN), a poisonous gas, and diatomic carbon (C2). Both of these substances glow green when illuminated by sunlight--a process called "resonant fluorescence." more images: ; from Günther Strauch of Borken, NRW, Germany; from Vincent Jacques of Breil, France; from Stanescu Octavian of Silagiu, Romania; from Dalibor Hanžl of Brno, Czech Republic; from Doug Zubenel of De Soto, Kansas. On July 11, 2007 there were 874 potentially hazardous asteroids.